You are currently browsing the archives for 24 January 2010. On a whim, Husband decided he wanted to try to make some hard apple cider (read ‘hard’ as alcoholic’). There are guys that he works with that are making wine and beer at home and even though we’re ‘wimpy drinkers’, we like an occasional beverage. I agreed to help if he wanted to give it a try, so in the ongoing process of cider making, here we go! 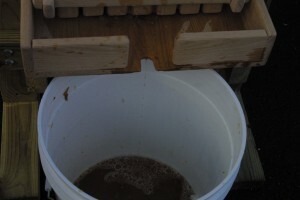 Husband did some research on the internet and soon was satisfied that he understood the basics of ‘home brew’. 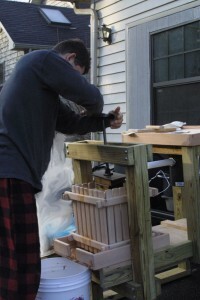 Then he set out to build a home cider press. Just like everything else he does, he did his usual excellent job. There will probably be a few upgrades and changes as he learn more, but it looks and works great! 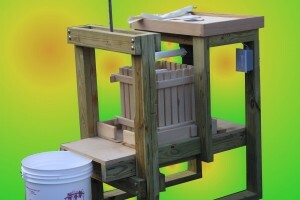 Here is a pic of the finished cider press. Wowsers! I’m impressed! I didn’t take enough pics, but if this is an ongoing process I will next time! We bought 3 dozen apples (3 different kinds) to try for our first press. We used a mix of Gala, Granny Smith and one I wasn’t familiar with, Braeburn. We froze the apples because according to what we read, it helps concentrate the sugars to make better cider. For a first time we only made 1 gallon to see what it would be like. We are also thinking of a small apple orchard if we decide this is an ongoing activity. The morning was cold and crisp (a perfect fall/winter morning) for cider making. We took the thawed apples and quartered them. Then we put them through a brand new, but cleaned, garbage disposal and ground them into pulp. It was incredibly efficient and fast. The pulp was put into unbleached muslin bags for the press. 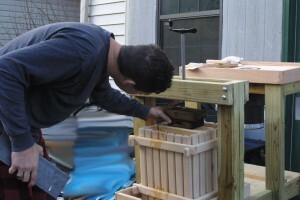 We used a screw press for the first time, but I think he’s going to switch to a jack press for future batches. He pressed several times, moving the bag of pulp around and we got approximately a gallon of apple juice. So far, working as intended! The juice is now combined with a cup of sugar and some yeast and is sitting in a 5 gallon container fermenting. It’s been 1 week so far. In 2 or 3 more weeks, we’ll be able to do a mini-taste, before moving it to the clarifying process. At that time we’ll probably do another batch, so if you’re interested, I’ll do more pics and be more specific at that time.